EU citizens legally resident in the UK should have the same rights as British citizens after Brexit, the UK prime minister has told EU leaders. "No-one will face a cliff edge," Theresa May said at a Brussels summit. Before Mrs May's offer, the EU proposed that EU citizens in the UK and the estimated 1.2 million Britons living in EU countries should continue enjoying the same rights, enforceable by the European Court of Justice (ECJ). An estimated 3.2 million EU citizens live in the UK and there is much nervousness - some even fear deportation. Mrs May sought to reassure the UK's 27 EU partners, saying the UK "does not want anyone here to have to leave, nor does it want families to be split up". Her offer brought a cautious response. German Chancellor Angela Merkel described it as "a good start" but said many other issues around Brexit still had to be resolved. 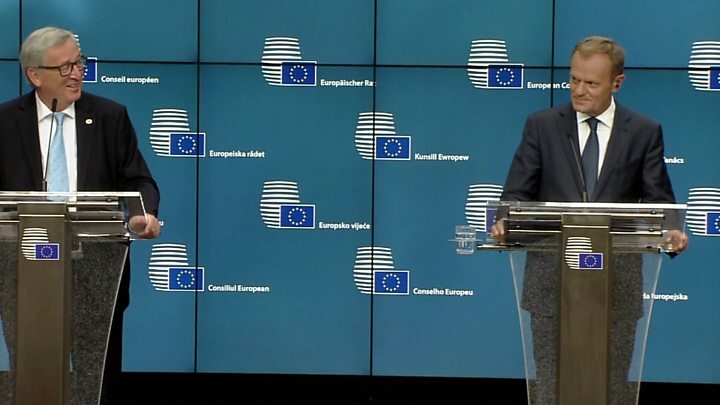 A senior EU official told the BBC that when the full details of the UK proposal were published on Monday, they would go through them "line by line". Mrs May's Brexit statement took up little of the summit's time. There was no debate as the EU is anxious to avoid any splits emerging. The UK election has left Mrs May seriously weakened, heading a minority government, which has fuelled uncertainty about the whole Brexit process. The UK's exit deadline is 30 March 2019. A cut-off date for obtaining "UK settled status" is yet to be announced. Both sides would like to get the issue of citizens' rights wrapped up as soon as possible - it would be good for morale to get an early win, and they have more difficult issues to tackle. But while there is a sense that progress can be made, there are still some tricky technical questions to deal with. Which rights will be extended to immediate family members living elsewhere - to children in particular? And who will guarantee citizens' rights in the event of any legal dispute? The EU has already insisted that the European Court of Justice should be involved; the UK insists that British courts should uphold the deal. It is also not clear what the cut-off date should be for citizens to qualify for any offer that is agreed. The UK proposal suggests a date between March 2017 and March 2019 - although it is highly unlikely that the EU would be willing to accept a date that has already passed. From an EU perspective, what we've heard so far from the UK side remains rather vague. EU negotiators will want to see the details of this proposal which are only due to be made public next Monday. EU citizens who settle in the UK before Brexit will get a grace period to reach the five-year minimum for residency - but only if they arrive before the cut-off date. The UK is anxious to start negotiating a new trade deal soon, but the EU has already won the argument that its Brexit priorities must be addressed first. 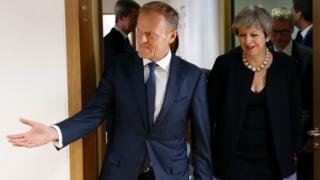 As the summit got under way, European Council President Donald Tusk emphasised that the door to the UK staying in the EU was still open. Quoting John Lennon's Imagine, he said: "You may say I'm a dreamer, but I'm not the only one." Dutch Prime Minister Mark Rutte said that as an Anglophile, "I hate Brexit from every angle." "It is crucially important we know what Britain wants from Brexit," he warned. The Netherlands is one of the UK's closest EU allies, with a similar stance on free trade. Mrs May has vowed to take the UK out of both the EU single market and the customs union. But there are many voices - including in her Conservative Party - pressing for a softer approach. "I hope we'll come to some form of continued [UK] membership or relationship with the internal market," Mr Rutte said. "I absolutely believe the UK will be hit in the economy and the pound very hard." Counter-terrorism has also been a key issue at the summit which comes in the wake of an attack in Brussels on Tuesday. 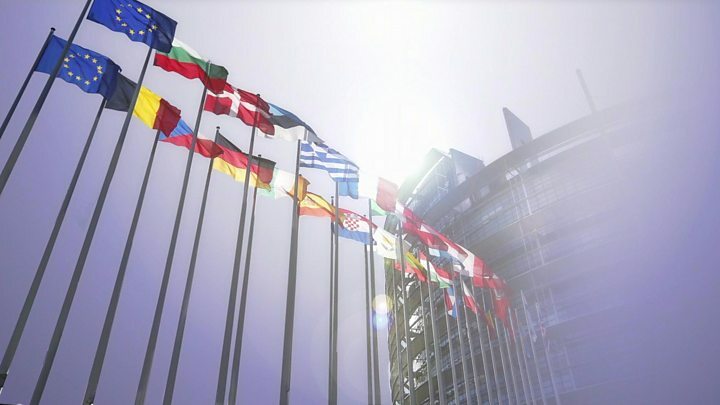 Several EU states have been attacked in recent weeks, including the UK, France and Sweden, and Mrs May said that an attack against any member state was an attack on all. The 28 leaders agreed to put legal pressure on internet giants like Google, Twitter and Facebook to remove jihadist content faster and more proactively. Mr Tusk said the bloc was calling on social media companies to do whatever was necessary to prevent the spread of terrorist material and was prepared to pass new legislation. "This means developing new tools to detect and remove material automatically," he said. The EU wants the industry to help tackle the problem of attackers slipping under the radar by using apps with end-to-end encryption. Video EU summit - what do we know about it?